French jewelry house Boucheron, which celebrates 160 years of operation in 2018, was established in 1858 by Frédéric Boucheron. Young Boucheron opened his first Galerie de Valois boutique in Paris. In 1893, he moved the boutique to 26 Place Vendôme, creating a new “Mecca of French jewelry”, according to the jeweler’s website. After Frédéric Boucheron’s death in 1902, the company was managed by his descendants. In 1994, Boucheron was sold to Schweizerhall, then to Gucci in 2000. Gucci was bought by Kering in 2004. Over the years, the Maison has been interested in fine gemstones and exotic materials in its jewelry, including lapis lazuli, coral, hematite, onyx, hemp and snakewood, as well as rock crystal. The pieces created by Boucheron enjoyed royal patronage – from the Reza Shah Pahlavi to H.M. Queen Elizabeth II, who wears Boucheron jewelry. The french jewelry house also attracted plenty of Hollywood glamor, and its jewelry and diamond jewelry pieces have been worn by icons such as Greta Garbo, Rita Hayworth, Marlene Dietrich as well as present-day celebrities – from Eva Longoria and Nicole Kidman to Rachel Weisz and Diane Kruger. Today, Boucheron has dozens of boutiques worldwide, where it sells its watches and jewelry, as well as Boucheron branded men’s and women’s fragrances. Recently, to mark its 160th anniversary, the jeweler launched a new line inspired by nature and set with diamonds – the Nature Triomphante collection. 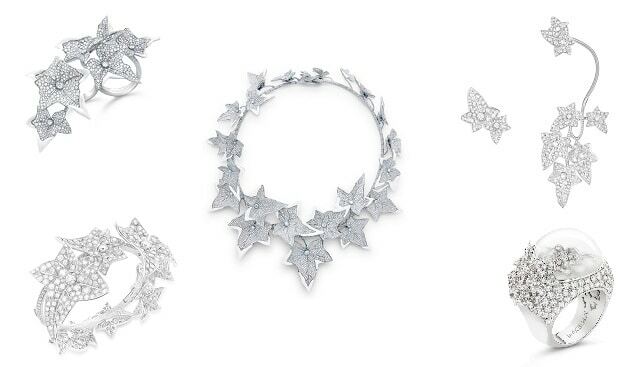 Among the pieces are the LIERRE GIVRÉ set – a necklace set with cacholong and paved with diamonds on titanium, and a ring set with cacholong and paved with diamonds on titanium; and the LIERRE DE PARIS – a set of earrings paved with diamonds on white gold, a bracelet paved with diamonds on white gold and a ring set with a rock crystal dome and mother-of-pearl, paved with diamonds on white gold.